Picking up from last week's revelation of a new resident in the 'Gothenberg annexe' here is the black bird, we have called her 'Dumpling', sitting on her three eggs. She is perfectly happy to go in and out past me, even hopping on my feet as she goes. 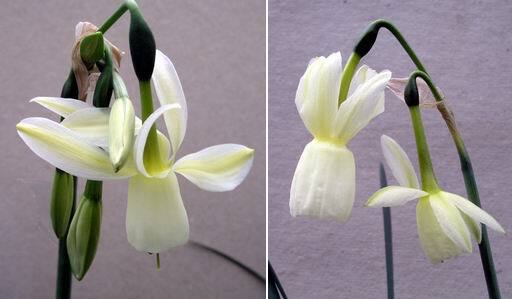 Another of my favourite narcissus, which I do not find easy to keep going for long, is N. triandrus. It may be that the bulbs are short-lived - we have this expectation that bulbs should go on for ever but it may be that they have an expected length of life just like we do. I keep raising it from seed, get it up to flowering size then lose it within around three years - what are your experiences with this bulb ? On the left is Narcissus triandrus and on the right is a cross that I attempted between N. triandrus and N. cyclamineus - I am not sure if the cross worked or if this is just another variation of Narcissus triandrus. 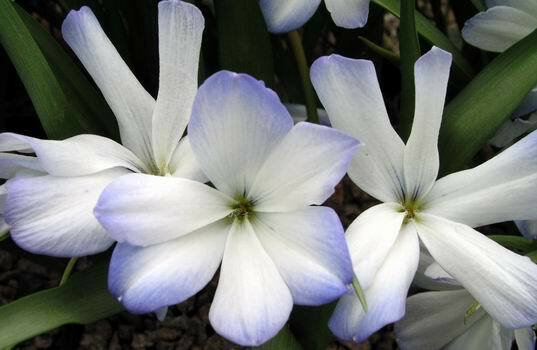 If you want to make hybrids N. triandrus makes a great parent as it crosses well with a wide range of other narcissus . 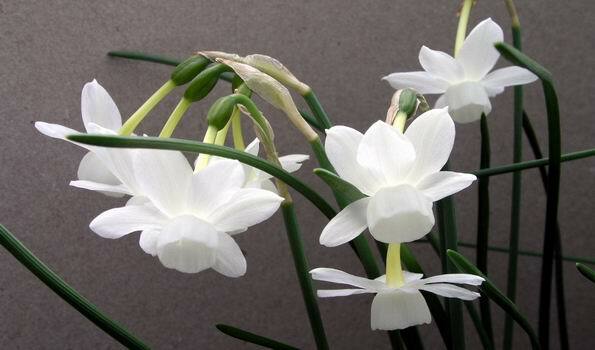 Narcissus 'Craigton Coquette' is one I made some years ago. As we now have two good pots full of it I will do some serious propagating this year (with the knife) to speed up the increase. It is a lovely wee hybrid that takes the best qualities from both parents, N triandrus and N. watieri. It is fully registered and has received a PC (Preliminary Commendation) from the Plant Committee. Narcissus triandrus x bulbicodium is another of my crosses but unfortunately it is proving slow to increase. We also grow N. x cazorlanus which is a Narcissus triandrus x bulbicodium hybrid that occurs in the wild but the one above has a more delicate and charming flower. I will show you x cazorlanus when it comes out. Just to keep up my effort to show things that I missed out last year here are two Muscari. On the left is one raised from SRGC seed collected in Turkey and just labeled as sp.(neglectum?) and it is the heavily scented yellow M. macrocarpum to the right. 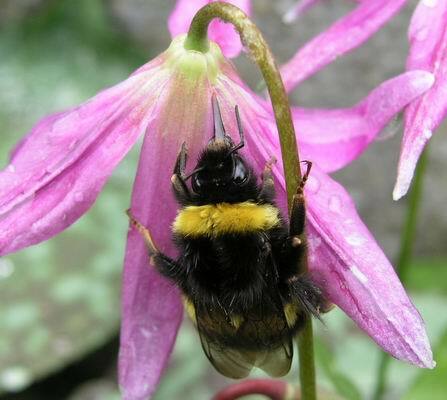 There has been talk, in the forum, of garden pests; well the bee is not a pest but a beneficial friend of the gardener helping with the pollination of flowers. Not this lazy 'so and so', who is breaking and entering to get the nectar reward without doing the pollination business. You can see his 'beak' ( I cannot spell probosus) poking a hole through the petals and I watched one of his friends actually snip off a petal of an Erythronium to get the nectar. I will try and resist showing you every erythronium we have ( I plan to do that in the future, the Erythronium File is looming!) this is Erythronium grandiflorum with brown anthers, before the pollen broke out they were a shiny reddish purple colour. From the same batch of wild collected seed we also have forms with yellow pollen. I am often asked how to tell the difference between E. dens-canis and E. revolutum - the simplest way is by the leaves. On the left is dens-canis just look at how the markings on the leaves are spotted and blotched and, apart from the mid-rib are completely at random, now compare that with the centre picture(revolutum) where the markings are more inclined to follow the veins of the leaves. The right hand picture is E. americanum, its leaves are like those of dens-canis, random, spotted and blotchy. So the Erythroniums of Eastern North America and Eurasia have the blotchy pattern to their leaves and are possibly more closely related than all the Western N. American species. 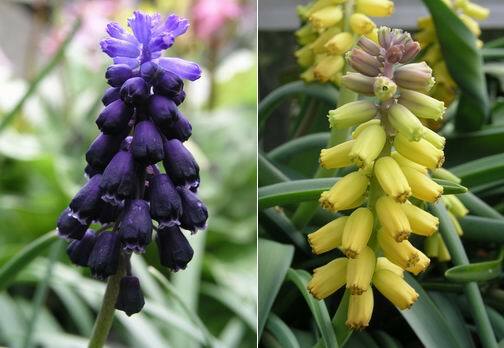 Just in case you are not hooked on Erythroniums, yet, here are a couple to tempt you. 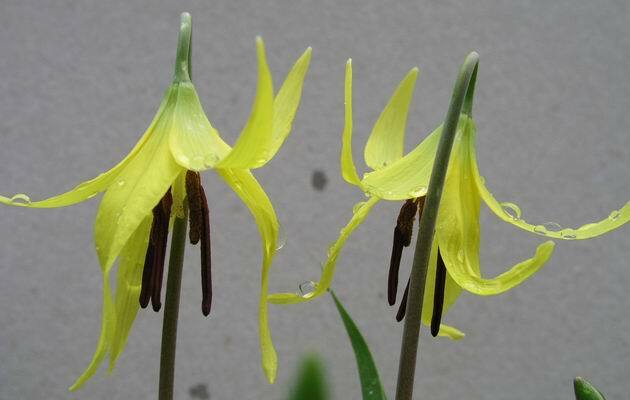 Far Eastern representatives of the Eurasian dens-canis complex ; Erythronium sibericum(left) and E. japonicum(right). The Tecophilaea are also looking good just now, this is one of our seed raised selections. I am looking forward to next year when the next generation of seedlings should start to flower. 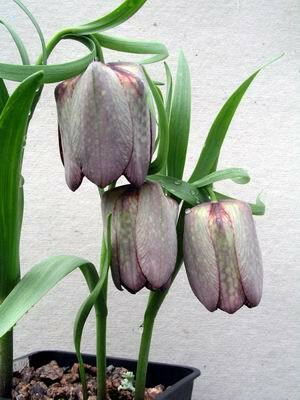 The frits continue to flower well and this Frit. tubiformis is flowering for the first time from seed ( again SRGC seed distribution seed). This just underlines how exciting it is growing bulbs from seed. 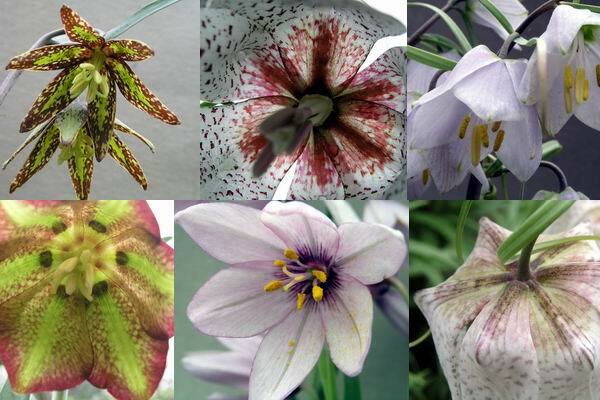 I will leave you with a montage of fritillaria flowers, try and name them, answers to the bulb log feed back on the forum, see if you can get it right.